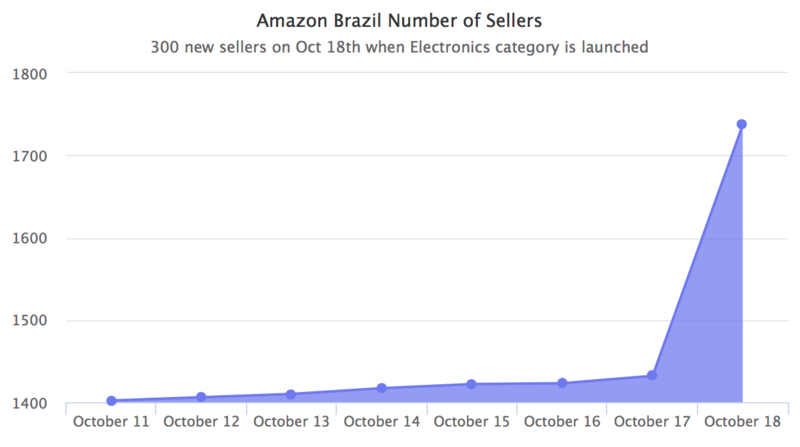 After launching the electronics category which offers televisions, cell phones and laptops, the Amazon Brazil marketplace overnight added 300 new sellers. Launched in 2012 as a Kindle store, Amazon Brazil started selling print books in 2014. Then in April this year it opened a marketplace for third-party sellers, but only to sell books still. Since then the marketplace grew to just over 1,400 sellers. By adding new sellers in Electronics it is now over 1,700 sellers strong. Brazil is estimated to be the 10th largest e-commerce market in the world. Amazon is a leader in half of those (United States, United Kingdom, Canada, France, Germany, and Japan), so going after Brazil beyond selling books was inevitable. Amazon’s main competitor in Brazil is Mercado Libre. Their stock price has fallen over 14% in a week, as Amazon’s expansion was starting to get rumored to happen. Brazil is the key market for Mercado Libre, accounting for more than half of sales. Mercado Libre has been growing steadily for years - it sold 61 million items last quarter, up from 43 million in 2016, and up from 30 million in 2015 - and we still think it is better positioned to win in the market than Amazon is. In terms of the marketplace more than 2 million sellers have sold on Mercado Livre in Brazil since its launch in October 1999. However many of those sellers only ever sold a few items, as just like eBay any user can start selling - less than 10% of those 2 million sellers sold more than 100 items. During the 18 years of operations Mercado Libre has become more like Amazon both in terms of functionality, and services offered. Amazon doesn’t have a Fulfillment by Amazon (FBA) offering in Brazil yet (for example when it launched in Mexico in 2015 it had the FBA service from day one). Prime memberships, and FBA have been key in other markets so without those Amazon appears to be just testing the market. Interestingly Amazon itself doesn’t sell any products in the Electronics category, utilizing third-party sellers to kickstart their catalog. 1,700 marketplace sellers on Amazon Brazil is tiny compared to the main competitor Mercado Libre’s 2 million, but it is a first move by Amazon to expand in Brazil. The true test for it though will be when it launches the full catalog, and the FBA service for sellers to use.